As you set out to accomplish any long-term marketing initiative in virtually any business, you’ll be faced almost immediately with the task of setting objectives. Unfortunately, many companies large and small don’t spend adequate time setting – no less understanding the importance of – objectives. 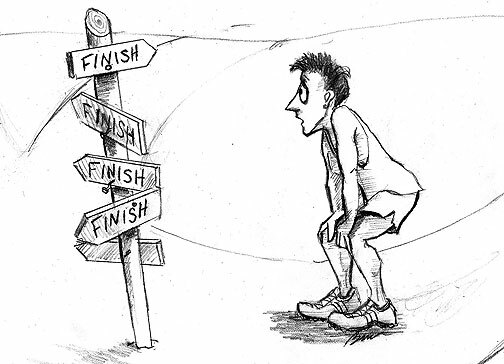 If you don’t know where the finish line is, how can you pass your competitors in the home stretch? Below, seven simple guidelines to understanding and setting marketing objectives. Depending on the size of your organization, there may be many objectives, and they should be categorized according to who will be accountable and how they will be measured. Loosely, you can have hard and soft objectives, where hard objectives are directly quantifiable (sell 20 million widgets through the direct channel in the next three quarters,) and where soft objectives are crafted to serve larger goals, like growing the company, or opening new offices, or improving the brand awareness levels. Types of hard and soft objectives include marketing objectives, corporate objectives, operational objectives, distribution objectives, promotional objectives, pricing objectives and more. We’ve all heard about the “SMART” objective acronym, where S stands for “specific.” Since objectives provide a baseline so that performance can be measured, specificity is the most important aspect – what you want, when you want it, what you’re willing to do to get there, etc. “Improve accessibility for our customers” is too vague to align your organization. “Create and deploy a customer support system in the next 18 months that allows our customers to connect directly with technicians and with each other in a format that’s conducive to their trade” is more specific and more useful. Sure, you want to accomplish a hundred things, but in the next few months, you should be focused. It doesn’t mean that all your issues are not important, but some will have to wait as you set objectives in a clear order. Even if you are embracing multiple objectives or objective types (see guideline #1 above,) this is not the time to waffle. So decide what you want to accomplish, set an order if you have a lot to tackle, then focus on the first item and get your team(s) (internal and external) moving in a unified direction. Whether it’s an individual or a team, there must be accountability, and that structure must also have contingencies. If you hire a CMO to turn the reputation of a company around, then that person is accountable to align the teams, manage the processes and meet the objectives. However, if the board of directors holds back the budget, or something unforeseen pops up on the radar, the structure of accountability must be refashioned in accord. The fulcrum of every marketing initiative is the strategy with which it will be executed. But the center of every strategy should be tied to objectives. It’s pointless to set a strategy without this critical connection. A strategy can be conceived of as a road map, and its efficacy should be judged in terms of the extent to which it meets the destination outlined by the objective set. 6. Don’t Confuse Tactics with Objectives. I’ve been in many meetings where someone says they have an “objective” of creating a Facebook page. While that may be a desire, it’s not an objective. It’s one tactic (of many possible tactics) that’s really only a means to an end. The objective, (if it included details like timing and other specifics,) in this case, is to create a structure and a location to enable a social conversation around the brand. A Facebook page, as an example, provides a fine tactical solution to meet that objective. As you can see, there are many reasons to stay focused and stay on course, but there is also an important caveat. With so many factors outside of your sphere of influence (competitors, geopolitical developments, economic fluctuations, emerging technologies, etc.) you must also develop the skill to be flexible, adaptive and even quick to embrace new models as opportunities and threats alike may be poised at the gate. This is also a time to let creativity run its course and let ideas evolve and embrace the magic of improvisation and performance. Once the cameras are rolling, or the mic is live, or the program has rolled out, anything can happen, and often what happens is simply a different “version” of what you expected… that doesn’t make it better or worse. But as long as it’s still on objective, the entire enterprise is elevated by and in the moment. It’s craft at its highest level. Enjoy it when you get there. Previous Article Point/Counterpoint: Who should set the marketing budget – the client or the agency? All great points. Of course, the implication exists there is an overall strategic plan with separate marketing and sales plans. Sales and marketing do not exist in a vacuum. There must be alignment between all functionalities of the organization. I use the Star Model to close those gaps because some of the objectives conflicted with strategies, structure, processes, rewards and people. Thanks, Leanne. I agree that sales and marketing cannot exist separately. They are intrinsically linked, although sometimes mismanaged, since many people think that marketing is a sales function, which it is not. Can you elaborate on the Star Model? Great insights. I am particulary in favor of being decisive. There’s nothing worse than trying to keep too many plates (objectives) spinning at the same time. That’s right, John. Not only does indecision increase anxiety, it also cuts into real-world metrics, like ROI, team productivity and more. Sometimes – particularly in marketing – it’s best to get one thing accomplished well than try to tackle four items and only have moderate success with any of them.